My first review of 2016 belongs to one of the best albums of 2014. It is a pity for me to miss listening to it in 2014 and adding to my best list at that time. Fortunately, I could catch the opportunity in the first quarter of 2015 after getting the album during Jazzahead in Bremen. As the title reminds at first sight, the album is like a spark. 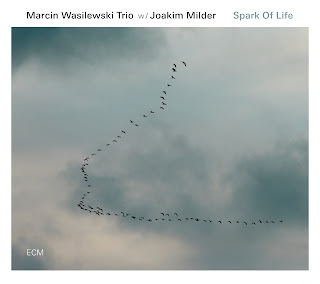 Frankly, an ECM album from long time Polish band Marcin Wasilewski Trio is a sufficient definition for any experienced listeners to have an idea; but adding Swedish Joakim Milder to many numbers in the album -as a tenor saxophone performer as well as a composer in one of them- seems to have created a very important temptation for European Jazz followers to listen the result of this collaboration. 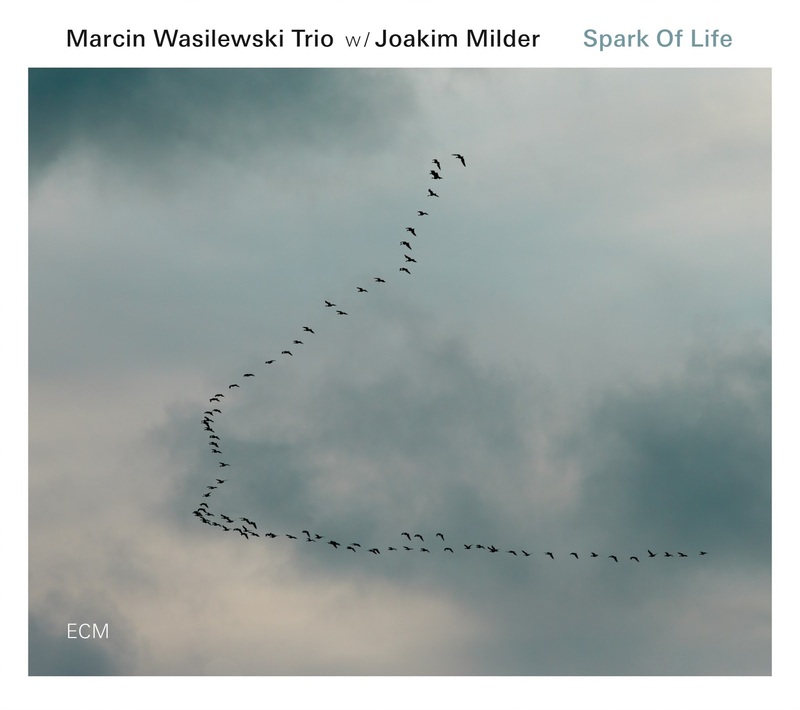 For me, a top notch woodwind collaboration of Joakim Milder with Marcin Wasilewski Trio in Spark of Life, creates an opportunity for listeners to make a sightseeing over a very well designed and standing still medieval city with a transparent flying carpet. We look at the trio's performance from different perspectives thanks to this carpet without adding any observer bias. We see four compositions from Marcin Wasilewski one of which - the title track - is performed twice in different versions. One number is composed by Joakim Milder. Sting's Message in a Bottle, Hey's Do rycerzy, do szlachty, do mieszczan, Herbie Hancock's Actual Proof and Komeda's Sleep Safe and Warm are covers which are performed in interesting arrangements. There is also a Slawomir Kurkiewicz’s arrangement for a composition by Grazyna Bacewicz. Marcin Wasilewski waits for drum and bass to join him before passing from his solo part to the main theme in the introduction part of the first piece Austin. Then, a very familiar Wasilewski Trio style spreads to our ears and promises us an album deserving a dedicated listening session from beginning to end. This is a style which is aware that silence is as important as sounds. The low level crashes coming from Michał Miśkiewicz's drum set are just amazing. While the main theme is being carried out by the piano, the whole sound feels like spring promised by snows melting next to a river. Ladies and Gentlemen, we can be listening to one of the most amazing entrances made for a jazz piece in Sudovian Dance. A very catchy melody is very successfully presented by a sublime piano tone and a very minimal, touchy rhythm section. Above all, there flies a very dignified and confident saxophone which creates a magic ambiance. The main theme seems to carry some reflections from Eastern Europe roots considering also the title and the rhythm. The first cool sentences of Joakim Milder is answered by a short piano response and then the saxophone starts to talk with a more lyrical wording. The first part is ended with some saxophone partitions which signals a change. This change is also dominated by Joakim Milder. A ballad-like performance of him proves once again that he added another important album to his guest-musician-discography. 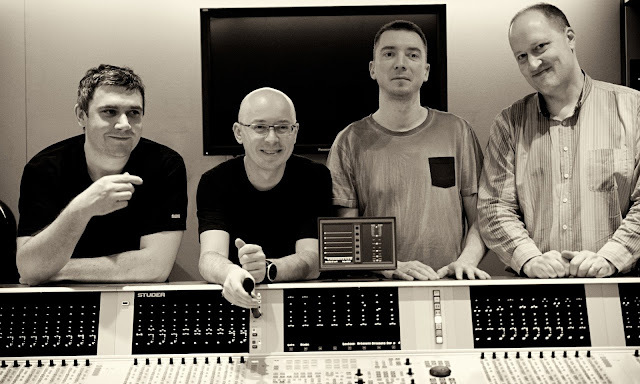 His very controlled and lyrical sound seems to be a very organic part of Marcin Wasilewski Trio and this very well defined sound is like the 4th dimension to trio's 3D world. We are at that very first time when an electrical -maybe divine maybe not- touch is about to initialize life on earth. First percussive particles of Spark of Life seems to symbolize some inorganic ancestors who waits for some woodwinds to hit in order to turn them into living beings. The title track is really strong and impressive not only with its touchy saxophone partitions but also with the trio's improvisational collaboration while responding to Joakim Milder. Message in a Bottle is covered many times by jazz musicians. According to the documentary "Musical Brain", it is not coincidence that there are so many hits belonging to Sting. In this documentary, a software running on a database created by all popular hits found out that almost all Sting's pieces carry all the necessary components to be a hit. For sure, the main component is simplicity which makes a piece catchy for a massive number of audience. So we can say that Message in a Bottle is a simple piece, at least considering my above very scientific explanation, which can be unnecessary for an album review. Although it is easy to cover that piece and there are so many around, only some can be complex and delicate enough for the listeners who desire much more. Marcin Wasilewski Trio manages to play this hit in a very jazzy manner and turns it into a very different thing. Especially Marcin Wasilewski works hard to fill all the dots specified by Sting and he also adds a great solo part. The double bass solo of Sławomir Kurkiewicz needs a closer attention too. Sleep Safe and Warm is another very well known piece especially in European Jazz albums made by Polish musicians. Being a legendary composition and a part of a famous soundtrack and movie, it deserves to be played over and over. Komeda has a very special meaning for Marcin Wasilewski Trio since it gave an inspiration and title to one of their first albums. This arrangement and cover is unique mostly thanks to Joakim Milder's beautiful performance. We find the opportunity to listen to the trio in their basic format in the middle of the album with Three Reflections. The minimal brush rhythms and low frequency and level double bass accompaniment to soft piano touches create what we very well know as simple acoustic trio. This type of music may not even need a composition to impress the listener. It's like a river flowing on its bed from a high level source to a sea. By its own potential energy the sound turns into music. I really liked the tensional rise through the end of the performance, resembling to the rage of waters. Joakim Milder's catchy composition Still has an obvious Scandinavian soul - melancholic but energetic too. Although it is initially and mainly driven by Joakim Milder's amazing tone, in my humble opinion, the piano dominated trio performance in the middle, needs a closer attention too. The last part where the quartet rises the tension in a very harmonious manner and Michał Miśkiewicz uses the whole dynamic range of his set, is another attractive performance of the piece. Herbie Hancock's electrical masterpiece Actual Proof finds a very acoustical place in the album. Even it is surely played with pure acoustical instruments of the trio, the arrangement and the styles sounds to carry some electrified soul. The drum solo encouraged by the piano is impressive. Largo -arranged by Slawomir Kurkiewicz’s for the composition of Grazyna Bacewicz- is like a calm and a little bit cold sea port through the end of the album with its dark ambiance parts. We listen to nice and hopeful bass solo in the beginning and the end is also another hopeful trio performance. Between them, the trio travels around classical music part of jazz. The trio version of Spark of Life says a very soft goodbye to the audience in the end of the album. The album was recorded in Lugano in March 2014 and produced by Manfred Eicher. Stefano Amerio, Morten Dalbaek and Gildas Bocle are names behind the desk in the studio. There is not much to say about recording or sound quality of an ECM album. It's one of the references that you can show people how detailed and sharp a jazz album can be recorded, mixed and mastered.